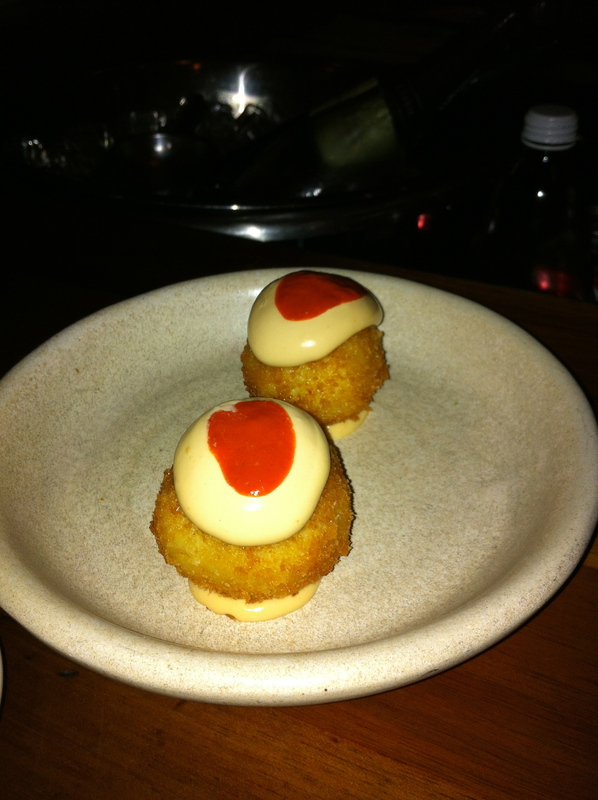 Movida Next Door | 15,000kms of Food! After a few drinks on a weeknight we ventured to Movida Next Door for a late dinner. You’d think that one would not have to wait for a table at 9pm but we were hanging at the bar for 20 mins before getting a seat to eat. Aside from that, dinner was marvellous! Food, service and drinks were all perfect for a quick late dinner after a couple of drinks. 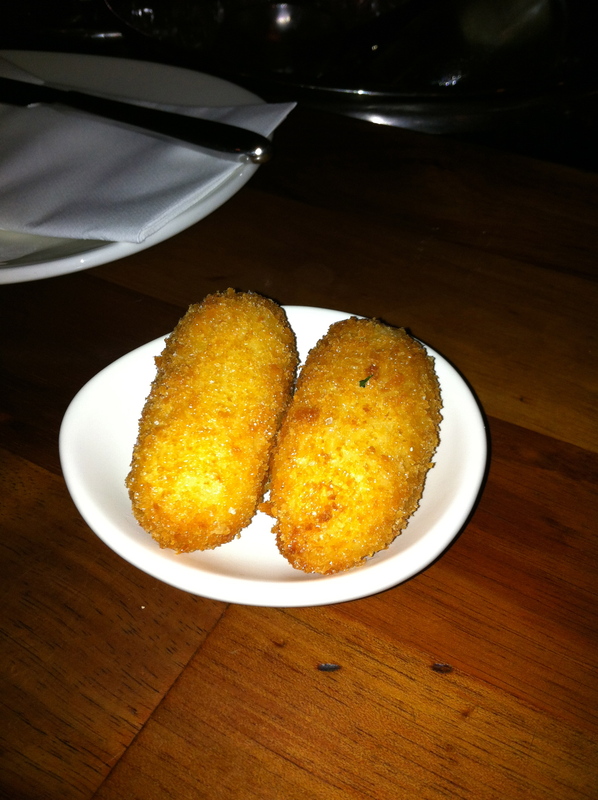 First up, we had the “Croqueta – Fried Croqueta of Hamon and Leek“. It was soft and creamy on the inside, and crispy on the outside. You could really taste the leek through the croquette. Yum! We then had something from the specials board – which was “crumbed soft pulled pork“. It was meaty goodness and similar to the croquette contained wonderfully soft tasty pork encased in a crunchy crispy outside. Delicious! 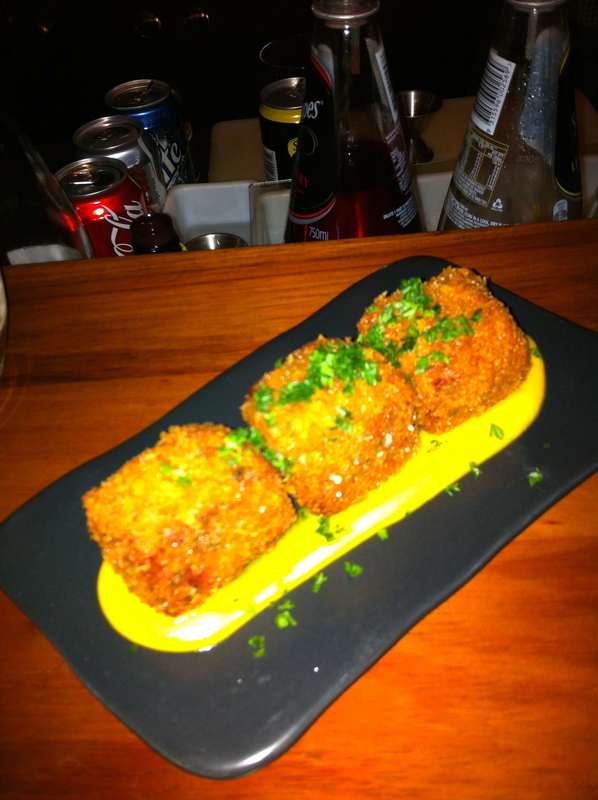 My old favourite is the “Bomba – Chorizo Filled Catalan Potato Bomb with a Spicy Sauce“. You can’t go wrong putting a salty spicy sausage inside mashed potato and deep frying it! And topping these mouthfuls of delight is a yummy sauce. 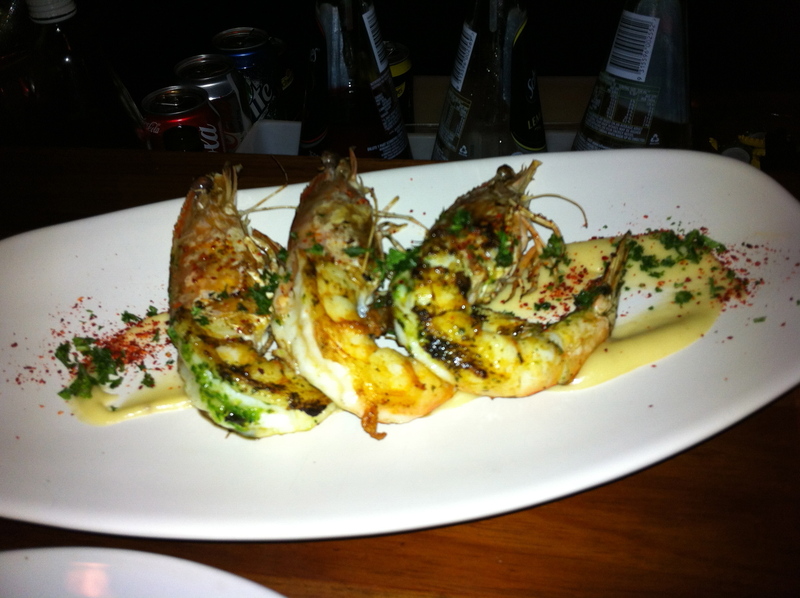 The “grilled fresh prawns” were absolutely stunning. Fresh, cooked perfectly and simply and tasty! I’ve been on a cured meat rampage of late and therefore could not resist the “Embudito – Selection of Spanish Small Goods“. Salty, smokey, meaty, spicy and with varying consistencies…. all very good. Especially with beer! This dish was good, but after all the other fantastic ones, this one was the one I could have done without. Don’t get me wrong, it’s still good, the other dishes are just better. 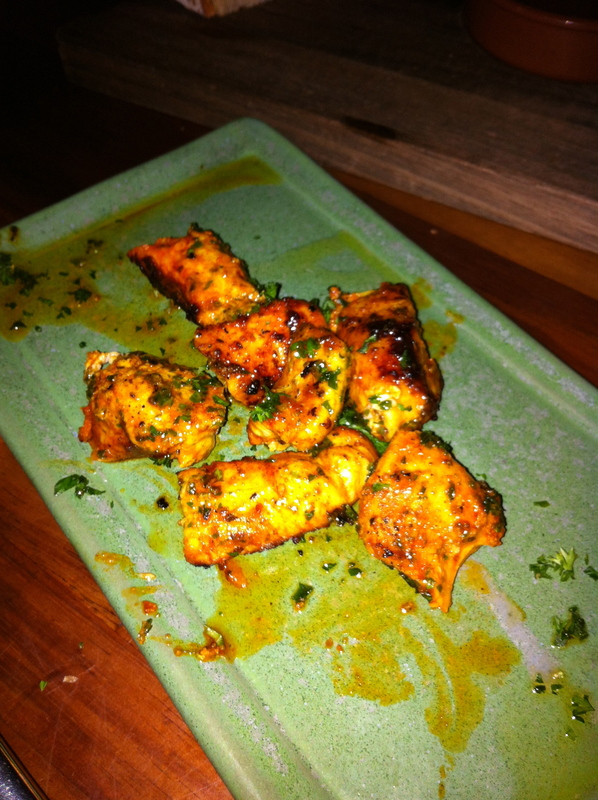 “Pollo – Chicken Skewer Grilled on Charcoal” – tasted like barbecued chicken! Apologies for the photo below, we were already digging into it by then! The last dish we had was outstanding. 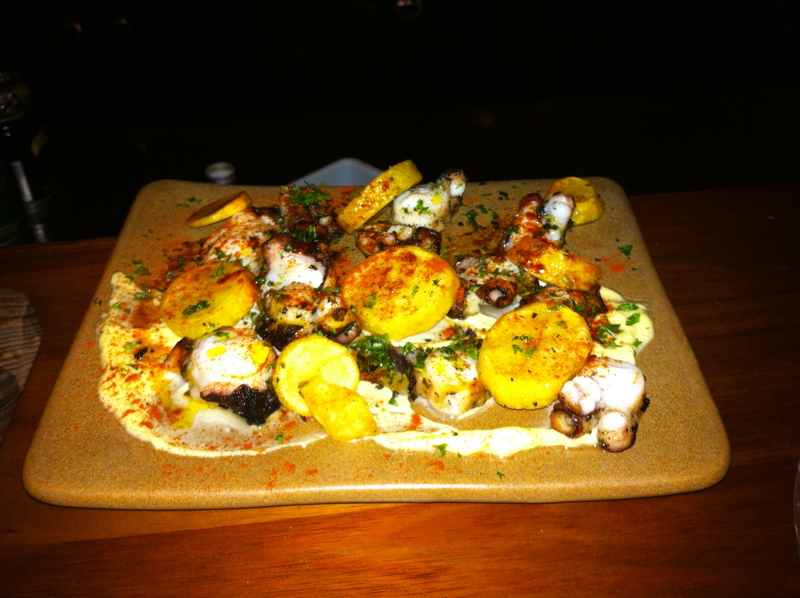 It was another chalkboard special of “Grilled octopus“. It came pretty as a picture and was served with potatoes and various sauces. The octopus was grilled and cut into bite sized pieces along with the potato. Yum! 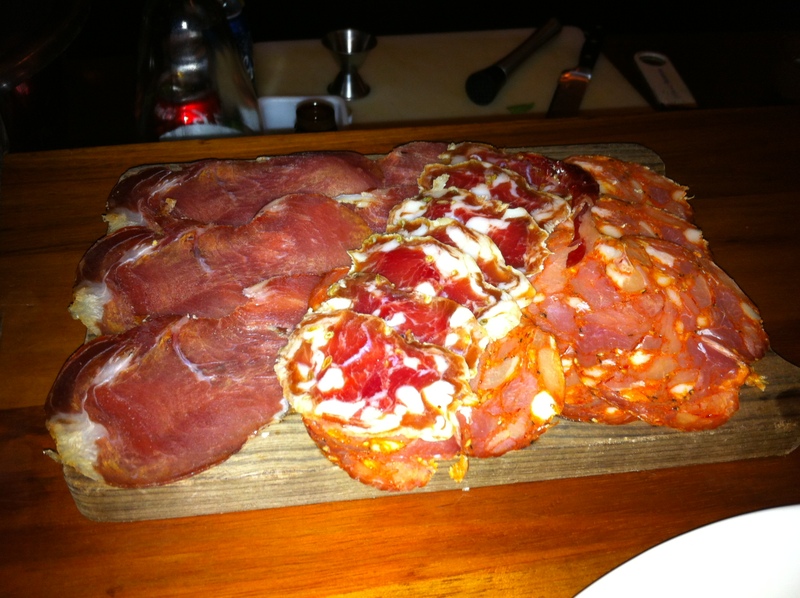 As always, the Movida experience means that you’ll get tasty fresh Spanish food. I’ve not once been disappointed and can’t wait to go again for a late dinner! Previous PostThe Commoner… not so common!Next PostGreat dinner at Cumulus Inc…. Again!